A critical scrutiny of Edo State’s 2017 budget reveals huge transformation potentials inherent in it for the state and her people. First is the productivity stimulation and second is the institutional reforms and their conceptual basis. The conceptual basis for productivity stimulation in the 2017 budget is situated within the context that the growth and prosperity of any economy is a function of its productivity. That is, the capacity to produce must outweigh the capacity to consume if such an economy is to grow. It is against this background that Governor Godwin Obaseki stressed that agriculture would be the main focus of his economic agenda. It is also due to the heavy dependence of agricultural productivity on solid infrastructural base and network that N22.2bn and N22.3bn were allocated to economic stimulation and infrastructure respectively. Together they total N44.5bn, which represents 30% of the total budget. Thus, nearly a third portion of the entire budget has been earmarked to boost productivity. That goes a long way in reassuring people of a genuine commitment to upswing the consumption and productivity ratio in favour of the latter. Also worthy of note is the novel introduction of N7.5bn for investment promotion in the budget as well as the allocation of N14.72bn for what is classified as other economic growth enhancers, which represents a 144% increase from the previous year’s figures. Edo is therefore set to produce far more than it consumes and the implication of this is that the State’s GDP per capita will, in due course, climb further up from its current fourth position nationally. Another economically lucrative spot the budget casts light upon is the tourism sector. Governor Obaseki is of the belief that the most potent inhibitor and fastest killer of the tourism industry in any society is insecurity. An unsafe society or community, however immense and inestimable its tourist potentials are, can never attract tourists except those with terrorist intents. Hence, his plan to rejig the tourism sector by prioritising security. The proposal for provision of an organised community policing structure in the budget is a clear indication of a holistic and integrated approach to tourism development and permanently tackling general security challenges in a manner unlike the usual contingency approach. Apart from its invaluable role in sustaining the hugely endowed tourism industry of Edo State, Governor Obaseki’s organised community policing initiative will be of use even in the non-tourism sectors. The farms to be cultivated, the mines and quarries to be opened up, and other such areas identified in the economic stimulation plan will obviously need a more effective and efficient security apparatus at the micro level. The interesting feature of community policing is that the men who will be deployed to a community will mostly be the natives. Their deep understanding of the terrains will boost effectiveness – let those who know themselves police themselves. Recruitment into the community police apparatus should in my opinion, form part of the envisaged 200,000 jobs by the government. It is worth mentioning at this juncture that the idea of operating a state-government owned policing system invites apprehension that it could be abused by incumbent governors for electoral advantage. But is it not a trivial worry when pitched against the sheer number of people dying every day and the stifling fear of investing in tourism that has attended the over-centralised policing system? There are democratic institutions, like the courts and the legislature, saddled with the duty of checking and punishing abuse of power. But there are no known democratic institutions that can bring dead persons back to life nor are there any ones constitutionally empowered to coerce people to invest in an insecure and chaotic environment. The solution to the possible abuse of community police by the governors is to strengthen our democratic institutions well enough to be able to, without fear or favour, either punish or reverse the gains of such abuses as quickly as possible. This takes us to the Institutional Reforms for which Governor Obaseki has made allocations in the budget. It is a generally agreed that democracy is the best form of government. However, without that salient ingredient, the rule of law, democracy loses its essence and allure. However, laws themselves do not actually rule in the literal sense as they are not persons, but documented statements prescribing how the society is to be governed by human custodians, who could possibly misapply those laws for selfish intents. These humans form the institutions which, given their role in the society, must always be characterized by a high level of scruples that affords them the boldness and courage to dispense justice with the fear of God alone. 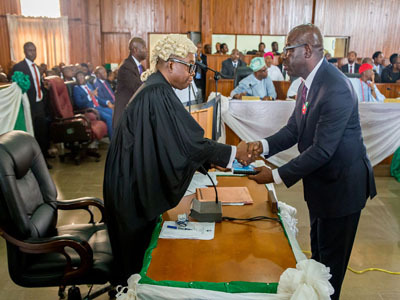 As such, Governor Obaseki’s dedication of N6.6bn to institutional reforms will no doubt facilitate the enforcement of the rule of law, and in the final analysis also serve to install some checks and balances on the proposed community police system. In the breakdown of this allocation, the sum of N1.58bn earmarked for law and justice represents over 560% increase compared with last year’s figure. There is no greater evidence than this for a strong determination to reform the custodian institutions of democracy thus putting to bed any fear of abuse of the community police. It is time Edo led Nigerians in thinking outside the box and, with this, Governor Godwin Obaseki has taken the lead! What about the promise to build new towns and its conceptual basis? When an economy is successfully stimulated and it consequently begins to grow, population pull and overcrowding is usually the ultimate result especially in the metropolitan areas. The inclusion of a proposal to build new towns in the budget is a bold, visionary and proactive step towards combating anticipated congestion challenges the state capital is likely to face – being one of the top six potential mega cities in the country. Social welfare is not left out. There is no doubt that encompassing as this budget proposal is, there must be persons who will not be directly impacted courtesy of the peculiarities of their lives and their levels in the society. These include the weak, the physically-challenged, the old and senile, who, by virtue of their condition, cannot meaningfully participate in the productivity this budget is expected to promote within the state. The indigent school children, the financially-challenged primary and secondary school students who are too young to fend for themselves also fall into this disadvantaged category. Therefore, the provision of N17.3bn to a comprehensive social welfare package encompassing sports, education, youth empowerment, health care and protection of the vulnerable demonstrates thoroughness in considering all sides to the economic proposal. The spread of capital projects as reflected in the budget breakdown indicates a crackdown on marginalisation in terms of development in every community. This translates to ample opportunities for the teeming number of youths in the state. Little wonder that the governor has been very emphatic in creating 200,000 jobs on assumption of office through the private sector participation and engagement. The general fear in achieving all of these based on the economic recession the country is experiencing has obviously been put into consideration as the expected receipts from oil, which funds the federation account from which the state will draw part of her revenue, has been benchmarked at the least value in the history of budgeting in recent times. If the price of crude oil goes higher than expected, then the excess that will come plus the accruing 13% derivation will be a boon to the state. Meanwhile the nature of the first set of appointments by the governor has clearly put more emphasis on professionals with the right attitude and pedigree for delivering results. The governor, having been a private sector person understands the need to set targets and meet those targets with the right tools and persons. I implore our people, both at home and abroad, to offer the government the needed co-operation towards a successful budget implementation as this is a budget that has taken into cognizance, the needs of the people, especially in creating the enabling environment for a thriving private sector that will lead to jobs, more jobs, and even more jobs. In a nutshell, Edo state budget for 2017 is avant-garde in modern Nigerian budgeting systems. I say this on the basis of the ratio of the recurrent to capital projects expenditure, which is tied firmly at 50:50. This automatically translates to more activities in the infrastructural development sector of the state by 2017. In a sentence, I will rather describe the Edo 2017 budget as the budget of all-round-possibility.